This print represents a performance of Banzui Chōbei shōjin manaita (幡随長兵衛精進爼板) by Sakurada Jisuke I at Nakamura Theater in 1818. 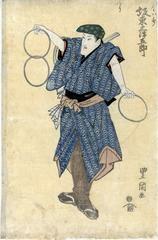 Waseda University has 7 different prints by Toyokuni I, including this one, from this particular performance. As of August 2014 we have yet to resolve the relevance of this figure with the rings with the play mentioned above.